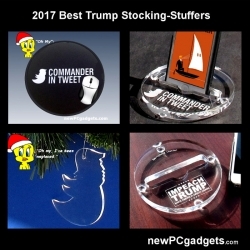 San Diego, CA, November 17, 2017 --(PR.com)-- With the country in an uproar over the current state of affairs, newPCgadgets has just introduced this Holiday’s best political stocking-stuffers and gag gifts to help ease the tension. newPCgadgets Tweety Bird Christmas Tree Ornament combines the silhouettes of a Bluebird and President Trump to create a one-of-a-kind Christmas tree ornament sure to be a conversation starter this Holiday season. Priced at $7.95 each. Their new Commander-in-Tweet Mouse Pad is made from 1/8" natural rubber with a black polyester fabric surface. The Commander-in-Tweet logo stands out prominently on the 8" diameter pad. Anti-Trump supporters will love this mouse pad, others not so much. Priced at $6.95 each. The Impeach Trump Smartphone Coaster is part of the newPCgadgets Political Smartphone Stand line of products. These smartphone stands are constructed from 4 1/2" clear acrylic. Designed to hold all iPhone and Android models upright and at an ideal viewing angle. The 5/8" opening is also wide enough to accommodate most phone cases. Priced at $8.95 each. Just like the Impeach Trump Coaster, the Commander-in-Tweet Political Coaster is designed for the activist in the family. Friends and co-workers will also appreciate this smartphone stand for propping up their phone while reading the President’s tweets. Priced at $8.95 each. "newPCgadgets has designed these new Holiday gift items to appeal to demoralized Democrats, frustrated Liberals and disheartened Republicans, or as they say 'about 90% of the population,'" says Michael Schriner, President of newPCgadgets. Visit newPCgadgets.com today for additional details.